Each month we select a spotlight school to showcase for the month. Our featured site demonstrates key skills in utilizing their ESE site. In the past all of our spotlights have been from our U.S. Education TV platform. We are excited to announce that for the first time this month’s winner is one of our ESE schools. Pali Production (Palisades Charter High School) in Palisades, California, originally joined a few years ago as a U.S. Education TV school. You may recall them as our “Gold Award” recipient during the 2015 ESE Awards. They recently made the transition to our ESE platform and completely revamped their site in just one month. Yes, this entire site was built in one month by the students at Pali Production! Their hard work and dedication deserves recognition making them our November Spotlight School. We look forward to seeing what this team can do in the future. Thank you for your continued success. How long have you been a teacher? How long have you taught in video broadcast? I have been a history teacher for about ten years, but didn’t start teaching a media class until 2008. The change occurred when some very motivated students approached me about developing a Production program. Although hesitant I committed to launching the new program with them. I went unpaid and we had no budget for over five years. There were many opportunities where it would have been easy to quit. My students kept me going and helped me see the long term value to a production program at Palisades Charter High School. All equipment was purchased by me or donated by generous individuals and local studios. It was definitely an uphill battle, but people began to see the value of a production program. After a few years our amazing Booster Club started giving us a yearly grant to help us in our mission of providing technical skills to interested students while simultaneously increasing a sense of community. Have you seen an increase in enrollment in these classes, or attendance rates go up since launching your U.S. Education TV/ESE site? Having a home for our videos was probably the best thing to happen to our program. It not only served as a way to organize our media but also allow interested students to see what we’re all about. Class sized increased from 14 to 30. For the first time in years we had to turn almost a hundred students away due to a lack of space and technology. Has your program received any other awards or recognition? While most programs seem to focus on studio shows we decided to allow students at the beginning of each year choose their passion. We then organize the class around this while still providing the same services to the community. I think it truly makes us one of the best programs in the country. Although our product may vary slightly every year I am always excited to work with every cohort that comes through Pali Production. When students are invested they work harder and have a more memorable experience. It also makes me work with them to provide the best possible experience each year. How has this platform helped you? Does it accomplish anything specific that you require? This platform allowed us to take our program to the next level. With a way to deliver our content to the community it held us accountable for what we were producing. On another level it allowed me to attract a new type of student to the class. We were no longer recruiting students interested in video editing. We also wanted students interested in graphic design, web design, advertising and public relations. The latter two have been the largest area of growth since we adopted our website. What is your favorite aspect of teaching video broadcast? Favorite aspect of the U.S. Education TV/ESE platform? At very few times can you give students complete responsibility for their work in high school and make it feel like it matters beyond the classroom. This platform allowed us to create several departments within the class. They are responsible for hiring and managing their own employees. When something doesn’t go right they need to problem solve and fix it. I’m more so their advisor than their teacher and I absolutely love seeing them succeed. 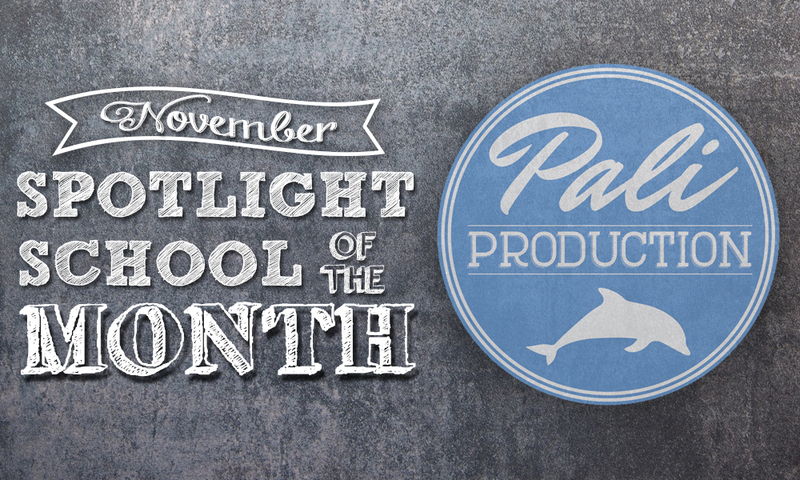 I never expected Pali Production (Palisades Charter High School) to be nominated as “School of the Month”. I’m so proud of all the students that have come through the Pali Production program. Each year they faced a set of problems, problem solved and helped improve the program for the group that would succeed them. I think I still think there is plenty of room for improvement, but I don’t doubt we’ll get there because my students are amazing. Click here to watch the School Tour Drone video.